I've been a fan of Doctor Who since before most of the current cast were born. So I was it was quite an honour for me when, a couple of years ago, a short story I had written was recorded by Big Finish Productions. 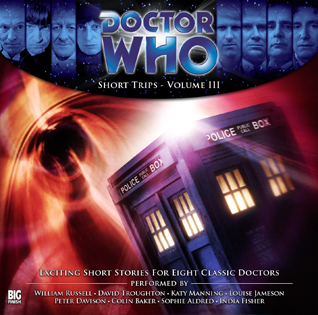 They produce and excellent series of 'dramatic readings' and full cast audio adventures of classic Doctor Who, using many of the surviving cast. My story was called 'Pop Up', and featured the third Doctor and Jo Grant. It was performed by Katy Manning (who played Jo Grant in the TV series in the early 70's), and features on the 3rd volume of their 'Short Trips' series.